The long awaited and requested Justin Chancellor Bass Rig has arrived. Tool have carved out a their own cult following and committed fan base. 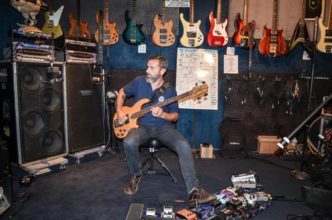 Justin Chancellor has always been praised as a big part of that due to his unusual hypnotic bass lines. Paul’s beefy tone was originally crafted using an Ovation Magnum and then a signature Chris Squire Rickenbacker. Just prior to his departure, he was also using a MusicMan Stingray*. Paul left during the recording of 1996’s Enima. Justin Chancellor then took Paul’s place and tried his best to recreate the original tone using a MusicMan Stingray* himself. He had said in interviews it worked well in the rehearsals but it was lacking a mid range punch when it came to recording the album. After a recommendation from Greg Edwards (of Failure). Justin tried a British made Wal bass and never looked back. A major attraction to Wal basses are their unique multicoil pickup construction. Each pole piece has its own ceramic magnet wrapped around the coil. Giving a warm, loud tone that is abundant in a high midrage. The Walnut Mark 2 has less midrange due to the walnut body. In Justin’s collection lies 3 other Wal basses used for various tunings and backups. There are now five. One of them is a fretless bass that I can not actually play (laughs)… Then, in addition to my standard bass – of which I have an exact copy to replace – I have a walnut and a MK-II in green. Justin has a brilliant ear for detail and is a connoisseur of bass guitars. Regularly trying different combinations of woods in search for a specific tone and sometimes just the sound of one note. Seen in Justin’s studio space, amongst his Wal basses are. On tour in 1996 he also used a Gibson Thunderbird. In 2016 in an interview with TopGuitarPoland he mentioned a Fender Precision in lake placid blue from 1963. This was also seen recently in March 2018 while playing with Deathgrip. In the interview with TopGuitar Poland September 2016. Justin also stated he was participating in the Warwick Bass Camp as a student and was very interested in buying a Warwick bass. Not long after this, the french Bassiste Magazine released a video of Justin showing how he plays Enima. In this video Justin performs using a Warwick Streamer*. It’s also interesting to note, this video looks like it was filmed at the time of the Warwick bass camp in September 2016. Justin is wearing the same clothing as well as the event wristband. In the summer of 2017 Warwick released promotional material for a custom shop bass they made for Justin. The new Custom shop Streamer Stage 2 is made with a beautiful combination of materials. including a Bubinga Pommelé Body and Tiger stripe ebony fretboard. Around the same time of this release, owner Carey Nordstrand of Nordstrand audio released a video explaining the inspiration behind the Big Blademan pickups as seen on the Streamer 2. In this video, Carey decided to build a bass in order to test specially built custom pickups. As a result the Big Blademan was born in tandem with a Justin Chancellor (JC-3b) preamp. Aiming for something familiar yet still different to Justin’s’ usual Wal sound. Carey says in the video that Justin kept this bass in September 2017, however in March 2018 the bass appeared on Carey’s Instagram page stating Justin had settled for the Warwick. While Justin didn’t keep the Nordstrand bass, he did however have keep the new BigBlade pickups and custom preamp, fitting them both on the Streamer 2. It’s dual coil pickups are described as “mean, gritty, powerful, bombastic, and loud.” Nordstrand build with ceramic magnets and laser cut vulcanized fiber bobbins. Which are a neat modern day alternative to Wal. Some news outlets have reported all musical tracks have been recorded and it’s up to Maynard to lay down the vocals. It’s possible the new album will be out this year and we can see first hand how the Warwick Streamer 2 shapes Tools iconic rythmn section. … But I wouldn’t bet on it. Coming up in part 2 we go into great detail about Justin Chancellor’s Amplifier’s and Effects pedals. Using Gallien Kruger heads and Mesa Boogie cabinets, the volume is not a thing to be missed. Justin is probably the second most requested bass player to come across my channel. However in first place it was Cliff Burton formally of Metallica that takes the top stop. You can watch the video and read the show notes on the Cliff Burton Bass Rig. After you watch Cliff Burton, the next logical step is Jason Newsted, click the thumbnail to watch this.